While on a coffee break during one of his shifts, Lt. Steve Bonini found himself fielding question from the community about issues they were dealing with in their neighborhood. This reminded of a program that he had heard of called Coffee with a Cop and he decided to start doing the same thing in El Cerrito. In El Cerrito, the Coffee with a Cop program is in its first year and has been a good experience for the officers to interact with their community. It allows them the space to interact with residents in a different capacity than they are used to and allows them to gain insight on what’s going on in each neighborhoods. 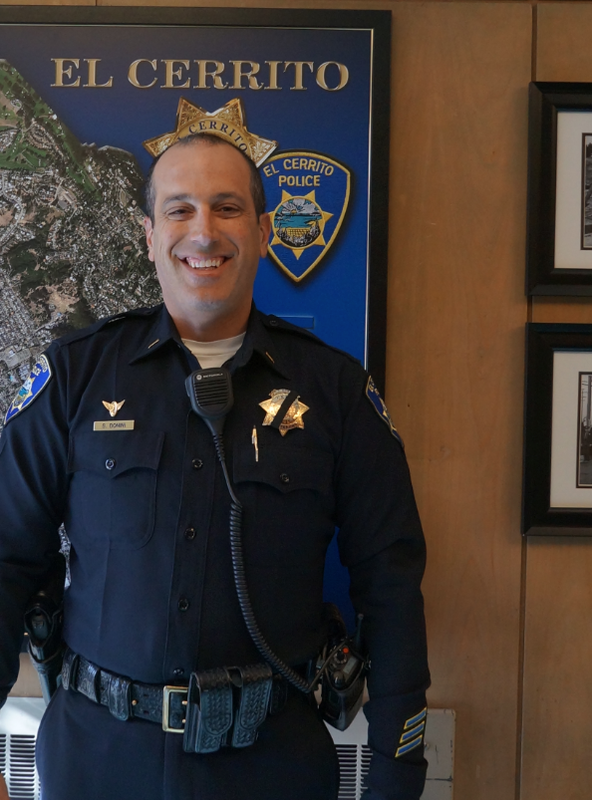 Bonini plans to continue the program quarterly as part of El Cerrito Police Department’s community outreach efforts. El Cerrito PD’s community engagement involves a diverse set of activities. This year will mark the 4th year of a charity bike ride they call “Bike the Bridges.” This event is organized to raise money for the Special Olympics and last year’s ride consisted of 580 participants and raised over $70,000 dollars for the charity. The School Resource Officers (SROs) have also served to build lasting ties with the community. In a typical American city today, the likelihood of the teachers living in the community they teach in is low. SROs therefore end up being more likely to run into their students around town and being a common face in the community allows young people to develop relationships with these officers. Currently, El Cerrito has 5 SROs; 3 in the local high school and 2 in the middle school. Since these officers have such lasting ties with the community, they can often de-escalate tense situations rather quickly when they encounter former students during patrols. Lt. Bonini is also focused on partnering with the neighboring cities to combine efforts with reaching out to the residents. Because of El Cerrito’s location and because the area’s school district allows intra-district school transfers, developing working relationships with area police departments is important to the entire region. West Contra Costa County schools allow students to transfer to schools outside of their district. While this can be in the best interests of the students, they can find themselves without their usual support networks and problems may arise. By coordinating efforts between cities, SROs serve their students with a broader understanding of their communities. El Cerrito PD also has a couple of training programs for people, young and old, to get first-hand experience in law enforcement. The Explorer Academy is a program that is organized in conjunction with the a subsidiary of the Boy Scouts of America and offers young people aged 14-20 a chance to learn more about police work. They get a chance to go on ride-alongs in police cars, attend training in various aspects of police work, firearms and tactical training, and work traffic control and public events. The Citizen Police Academy is a similar program that is geared for adults. This program teaches the Hows and Whys of police work and trains participants in the K9 program, Crime Scene Investigation, Use of Force Simulators and Driving Simulators. Both of these programs offer the public a glimpse into the working lives of what a day as a police office may look like and can give them a better understanding on what is involved in police work. Many of the El Cerrito’s volunteer police officers come out of these academies. El Cerrito Police Department and Lt. Bonini have laid out a diverse strategy to work with their community. The Coffee with a Cop program allows for police officers to interact with the people of El Cerrito in a more casual way than they might otherwise. This helps to develop relationships between the residents and the police so they can work together more easily. The Bike the Bridges event gets the department and the community working together to raise money for a great charity while developing that relationship even more. The Explorer and Citizen Academies give the public a chance to walk in a police officer’s shoes. This can give the public a better understanding of what it means to be a police officer and help them understand the police’s role in their community.